My recent viewing of La Luna has given me a hankering to check out a few more Pixar shorts, and the one I was most anxious to revisit was 2000’s For the Birds, which played before the studio’s 2001 feature Monster’s, Inc. The story is simple enough: a small blue bird lands on a telephone wire, but before it can get comfortable, another bird settles in right next to him. As the two bicker over which has the right to this coveted space, a third bird lands. And then another… and another. Before long, an entire flock is resting on the wire, each bird arguing (quite loudly) with its neighbor. It’s at this point a giant-sized bird, perched on the nearby pole, gets the others’ attention by waving at them. The birds on the wire mock the larger bird, who appears to be a simpleton, but when it flies over and takes its place between them, the larger bird’s extreme weight causes the telephone wire to bow, dipping it so low that it nearly touches the ground. As a result, the other birds, all bunched up next to him, make an effort to rid themselves of this troublesome fowl. They do eventually force their over-sized peer to let go of the wire, resulting in a calamity that none of them expected. 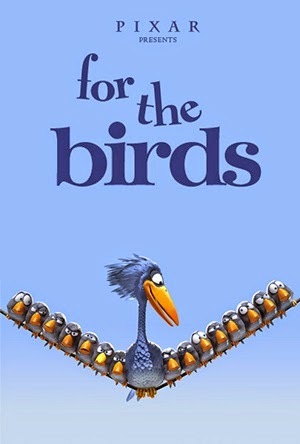 The brain child of Ralph Eggleston, For the Birds is absolutely hilarious, and so impressed Academy voters that, in 2002, they gave it the Oscar for Best Animated Short, marking the third time Pixar won the coveted award (after Tin Toy in 1988 and Geri’s Game in 1997). Colored with vibrant blues (both the sky and the birds themselves), For the Birds is a gorgeous bit of animation, but it’s the film’s very funny story that makes it so rewarding (the payoff scene, where the little birds get their comeuppance, is an absolute riot). Watching this short in a darkened theater with a couple hundred other patrons back in 2001 was a fun experience, and put everyone in the perfect mood for Monsters, Inc. It usually takes a while for audiences to warm up to a comedy (whether animated or otherwise). Thanks to For the Birds, that entire theater was in a laughing mood before the main feature even started.